Gundulic Square is located at the end of Ulica od puča (Ulica = Street; puči = type of well). The square was created as a consequence of the Great Earthquake from 1667 as the houses located on the spot were reduced to rubble. 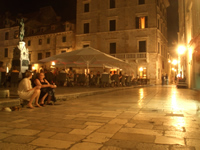 Today the square is home to the statue of Dubrovnik poet Ivan Gundulić, a work of sculptor Rendić from 1893. On the square is also a small Amerling fountain, a donation by benefactor Mr Amerling. Ivan Gundulić was born in Dubrovnik, in 1589. He was educated in his home city. He was elected twice for the Rector of Konavle, he served as the member of the Dubrovnik Great Council and later as a member of the Small Council of Dubrovnik. He held several public posts in the Dubrovnik Republic, and if he had not died in 1638 he would most probably also had been elected for a Rector of the Republic. Gundulic is the most significant representative of the Baroque period in Dubrovnik. His work embodies central characteristics of Catholic Counter-Reformation: religious fervour, insistence on "vanity of this world" and zeal in opposition to "infidels". The reliefs below the Gundulic statue are symbolic and describe the main motifs in Gundulic works. The particular relief depicted above shows a proud lady sitting on the throne (representing Dubrovnik and liberty) and the two beasts, a dragon biting on the throne represents the Ottoman Empire and the Turkish threat while the winged lion chewing on the carpet below the throne represents the threat to Dubrovnik's liberty from Venice. the epic poem Osman, in which he describes the Polish victory over Turks from 1621, celebrates liberty, and describes motifs of Christian liberty and the proud Slav feel. and the religious poem Tears of the prodigal son is based on the famous Biblical motif. The poem itself focuses on transience of life. All these works are good examples of Baroque stylistic richness and, frequently, rhetorical excess. Gundulić's role in the final standardisation of Croatian language can not be overemphasized. Ironically, his magnum opus, Osman, was not published in integral edition until 1844, when the Croatian Illyrian movement took his oeuvre as exemplary idiom of what they initially deemed Illyrian literary language, later standardized as Croatian and influencing Serbian. One of the leading Illyrian men of letters, politician, linguist and poet Ivan Mažuranić, successfully completed Gundulić's Osman by composing the last two chapters, which were left unfinished upon the poet's death. Ivan Gundulić died in Dubrovnik in 1638. His grave is located in the Franciscan church. In the library of the Franciscan monastery the oldest known examples of Osman the one from 1652 and the one from 1826 are being kept. can match your pure beauty! The Hymn is traditionally included in the opening and closing ceremony of the Dubrovnik Summer Festival as the "Libertas" Flag, a secondary flag of the former Dubrovnik Republic, is either hoisted or lowered from the halyard mast on top of Orlando Column, the chorus is following with the singing of the "Liberty hymn"